There really is no possible scenario in which FBI Director James Comey is not guilty of a serious error in judgment, and yet he continues to maintain that if he were to do it all over, he would do the same thing. We’ve seen in the past week a lot of new information on the scandal surrounding Comey’s decision to send a letter to Congress and reopen the Clinton e-mail investigation, culminating in today’s testimony before the Senate Judiciary Committee. On April 22, the New York Times published a lengthy article with the headline Comey Tried to Shield the F.B.I. from Politics. Then He Shaped an Election. Honestly, to me it seemed the New York Times had been played, and that they were basically parroting the spin their FBI sources were giving them. The gist was that Comey felt he had no choice but to do what he did. Only two things in the article really got my attention. First, the article revealed that already in the Spring, so around March or April, the FBI had determined that there would be no prosecution. Apparently, there was never going to be an announcement. In Comey’s testimony today, he implied that when Attorney General Loretta Lynch met on the tarmac with Bill Clinton in July, only then did the FBI Director determine that he should speak publicly. He issued his statement, he said, without clearing it with Lynch. In other words, had Clinton not met with Lynch, Comey never would have told the country that the investigation had come up with no grounds for prosecuting Clinton. He would have let Trump and his surrogates pretend that Clinton was going to jail all the way to the election. But for some reason, Bill Clinton chatting with the Attorney General changed his mind, and he needed to speak up, not, as we all assumed, out of a sense of duty to clear the Democratic nominee, but only to save himself and his bureau from right-wing criticism, which was building after the Clinton-Lynch meeting. One corollary of this, if what Comey says is true, is that Lynch did nothing wrong. After all, the investigation was already closed, just no one had bothered to say it publicly. Was she supposed to ignore and not speak with her old friend Bill Clinton indefinitely? Even after Hillary had been cleared? So everyone can stop blaming Bill Clinton and Loretta Lynch. 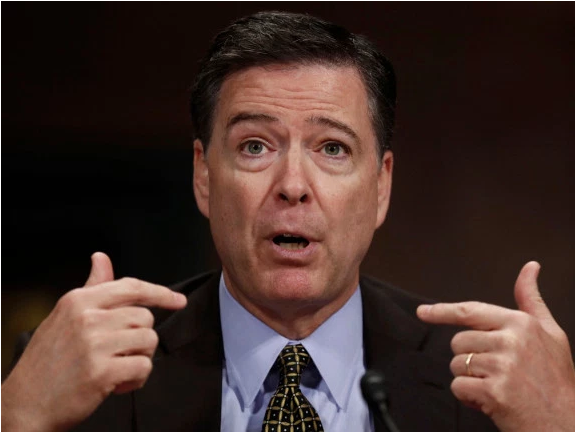 Comey not only issued a statement saying the investigation had uncovered nothing worth prosecuting, he criticized Hillary Clinton for her e-mail practices and then testified before a House Oversight Committee, promising at one point to let the Committee know if anything new developed. That “promise” was apparently on his mind on the morning of October 27 when Comey says the team investigating Clinton asked to meet with him. He says they disclosed that they had discovered metadata on Anthony Wiener’s laptop that showed it contained e-mails from Clinton’s Verizon/Blackberry e-mail. (Previous reports indicated that Comey was informed earlier, just days after the e-mails had been discovered by October 3.) They were particularly interested in finding e-mails from a three month time period at the beginning of Clinton’s tenure as Secretary of State. Those e-mails, dating from before she had set up the private server in her home, had not yet been located or reviewed in the prior investigation. According to the New York Times, Comey decided to allow his team to reopen the investigation, seek a search warrant to review the e-mails on the laptop, and then made the decision to notify the House Oversight Committee, which he did the following day. Comey explained to the Senate today that he was interested in those early e-mails because the FBI was still looking for evidence that Clinton intentionally set up her private server to violate the law. At one point during today’s testimony, Comey called that evidence “the golden missing e-mails,” as if they were searching for a prize in a chocolate bar. It was precisely the lack of any evidence of Clinton’s intent that Comey had relied on in July when he declared the investigation over. According to Comey, there was a “great debate” during that October 27 meeting on what to do. Comey felt he had only two choices, to disclose the new investigation or be accused of concealing it later. His instinct was to disclose. A junior lawyer, Comey says, asked if they should consider the possibility that disclosure would sway the elections. Absolutely not, Comey responded. He could not consider the political consequences and maintain his independence. Here’s where things start to break down in the narrative that the FBI and Comey are trying to push. There were many other options. First, someone, anyone, could have pointed out that there was no probable cause to search the laptop e-mails. (Indeed, it was likely the result of an illegal search that the FBI even saw the Clinton e-mails on the laptop in the first place.) I know, the FBI ultimately got a search warrant from Commissioner Kevin Fox in Manhattan after the story was already front page news (what else was he supposed to do? ), but most people who have reviewed the warrant conclude, as I do, that it does not give rise to probable cause to believe that evidence of a crime would be found on the laptop. Of course, knowing as we do that there was nothing incriminating on the laptop bolsters this view. What made anyone think otherwise? In the Commissioner’s defense, the FBI also failed to include in the warrant application all of the information regarding Abedin’s prior voluntary cooperation with the investigation, or the fact that no incriminating e-mails had been found in the prior investigation, information that the FBI had already made public in its lengthy report on the investigation published in September. But the real issue is whether, when they decided to seek a search warrant, the FBI had found anything at all to suggest that they would find evidence of a crime on the laptop. The only thing new in the search warrant affidavit is that there were e-mails between Clinton and her longtime aide Abedin on the laptop. What reason would anyone have to believe that those e-mails contained the “golden e-mails” that Comey and his agents were seeking? Remember, it wasn’t there. So what indication was there? We don’t have an answer from Comey or the sources informing the New York Times. And this is the big question that remains. What seems likely is that, as Comey wrote to Congress, the e-mails appeared to be “pertinent” to the investigation. Pertinent isn’t the same thing as probable cause. Probable means more than possible. It means you really think there is going to be something there. 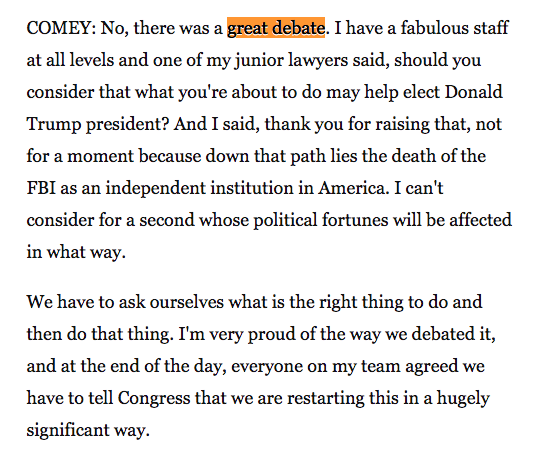 When Comey and his investigative team held their “great debate” on October 27, did they even discuss whether there was probable cause? That’s something we don’t yet know. There is no good answer for Comey. If they didn’t even consider the issue, that’s pretty damning. If they did consider it, why did they get it wrong? Why did they think they’d find their Golden Ticket? I’ve used the term “Golden Ticket” because it is very revealing of what I think actually happened. Comey and his team really wanted to find evidence that Clinton committed a crime. They were not dispassionate investigators who had been asked to determine if a crime was committed (which is how the investigation started). No, they wanted there to be a crime, as much as Charlie wanted to go to Mr. Wonka’s chocolate factory. A lot of people have challenged me on this argument by saying that there had been probable cause all along. But that’s not true. This FBI investigation was not the result of the discovery of a crime, or a report from a victim. Rather, it was a referral from another branch of government to investigate whether there had even been a crime. The FBI should have been neutral on that question. But they weren’t. They got caught up in the endless Republican fishing expedition that set off the investigation, and were disappointed that they didn’t find what they were looking for. It never even occurred to Comey or his agents that Clinton might be innocent and that no crime had actually been committed. No, as I suggested already last November, they considered Clinton a criminal who had not yet been caught. And it is worth pointing out that until October 30, the FBI had not yet obtained a search warrant in the case. Until that time, it was just an ordinary investigation of public sources, department materials and cooperating witnesses. Some people have said to me that this whole Comey thing just doesn’t matter. They’re wrong. It matters a whole lot. First, it’s important for Democrats to understand why Clinton lost because that will influence how they run in the future. If Clinton was a bad candidate, that’s one thing. If, on the other hand she was a good candidate, on the verge of winning a historic election until the FBI director snatched victory away in a deus ex machina, well, then that’s something completely different. Second, there’s the issue of Comey not even admitting that he made a terrible error in judgment, and even doubling down and saying that he would do it all again the same way. If that’s true, we need some new laws. It cannot be the case that the FBI director can publicly seek a search warrant against a candidate for president within days of an election and come up empty. In other words, if you get a search warrant under those circumstances, you had better find a dead body, or three, and a smoking Howitzer. Tied into this issue is the question of whether Comey’s actions changed the outcome of the election. Nate Silver came out today, again, with an article explaining in great detail the obvious — that with three (or four) states won by 1% or less, an event that made even a small number of people change their votes away from Clinton or stay away from polls instead of voting for her necessarily changed the outcome. The evidence is really beyond any reasonable doubt that Comey’s letter cost Clinton the election. Of course, Trump and his minions in their fact-free universe disagree, but leaving them aside, I’ve heard a few arguments. First, people say that the charts showing the polls moving toward Trump after the Comey letter are inaccurate because all the polls were wrong. That’s silly. The polls weren’t wrong. Nate Silver gave Trump a 26% chance of winning. That’s tails on two coin flips. It happens. And the actual result, with narrow victories in four states, supports that view. Also, even if you believe all the polls were skewed towards Clinton to begin with, you cannot ignore that they all shifted markedly towards Trump after the Comey letter. If you are going to deny the shift in popular opinion in the last ten days of the election, then you at least have to come up with another plausible theory supported by evidence. What is it? I’ve also heard some people say that since Comey’s letter didn’t change their mind, it didn’t change the outcome. That’s the narcissistic view and it really doesn’t answer anything. We’re talking about very small percentages of the voting pool. In any election, about 45% of the electorate is pre-set on each side. It’s the mushy middle 10%, the ones who haven’t already decided, that determine the outcome. Comey’s letter was enough to sway those deciders, and all of the polls demonstrate that it did, in sufficient number to change the outcome. If you don’t want to believe it, fine. But this isn’t about your beliefs. It’s about what happened. There are a lot of Sanders supporters who want to say that Clinton lost on her own, because it fits their narrative that Bernie was a better candidate and would have won. They want nothing more than to say “I told you so.” But all we know is that Sanders couldn’t beat Clinton. I’m not sure why anyone thinks he would have beaten Trump. We’ll probably never know. But it doesn’t help that argument to deny the impact Comey had on the election. It only shows that you have no real grip on reality. We won’t get to the bottom of it until we hear from the rest of the people involved. The one I’d really like to talk to is the junior lawyer Comey mentioned who asked whether he should think about the potential influence on the election. Comey said that in the end his staff all agreed on his course of action, but I wonder if that’s really the case. Because the junior lawyer was absolutely correct to bring up the influence on the election and Comey was absolutely wrong to ignore that issue. Contrary to what Comey claimed at the hearing, he was actually required to consider whether his actions would influence the election. The Hatch Act and department policy prohibit actions by public officials that are intended to influence elections. Comey might argue that he didn’t intend to influence the election, but the junior lawyer’s question demonstrates that he was completely and recklessly indifferent to the possibility. Such disregard might be acceptable if the public official was engaged in a core activity related to his office, but that wasn’t what Comey was doing when he sent his letter to the Congressional Oversight Committee on October 28. He wasn’t furthering his investigation in any way. Rather, he was trying to avoid criticism in the event his team found the Golden Ticket. Avoiding criticism is not the core job of the FBI, at least it shouldn’t be. And who decided that the FBI avoiding criticism should be more important than the outcome of a presidential election? But Comey’s defense falls for another reason. If his goal was to avoid criticism, he failed. Did he not consider the possibility that his team would find nothing and he would alter the course of the election? I listened to his testimony today and I really didn’t get any sense that he even thought that was possible. It makes him “mildly nauseous” to think about it now. How did he feel on October 27? He said he was presented with just two doors, disclose or conceal. But that’s pretty revealing, because the thing that he was disclosing or concealing was only the investigation, not any incriminating evidence. And the FBI conceals investigations all the time. In fact, that is their default rule. If he was worried about concealing, why was the search warrant application made under seal? No, as I heard Senator Leahy point out afterwards, Comey had a much better, and far less damaging option. If he truly believed there was probable cause, he could have authorized the search warrant. If the investigators found nothing, he wouldn’t have to disclose anything and there’d never be any criticism. If the investigators came up with the Golden Ticket, as he apparently expected they would, he could then have revealed the evidence. In the face of any criticism, all he would have to say is that he produced the incriminating evidence as soon as he found it. That, after all, is what he has been doing with the investigation into the Trump campaign. So, why not with Clinton? There is no good answer to that question, and it’s the one that most of the Democratic senators were angling towards. If I were questioning Comey, I’d focus on the issue of probable cause and the “great debate” they had. What did they debate exactly? Who took which side? And I’d ask him “What made you think it was probable you would find evidence that Hillary Clinton committed a crime?” There is no possible good answer to that question. Either he didn’t think there was probable cause, in which case he should never have authorized the further investigation. Or he did, in which case he was very wrong. I’d also focus on what happened during that final week. Did he really authorize the search warrant on October 27 but they didn’t submit the application until Sunday October 30? Each and every day after that, they found nothing. On Monday they found nothing. On Tuesday they found nothing. Etc. What was reported to Comey? Comey said that what they really wanted was to see the Blackberry e-mails (not the ones from the server). Is the New York Times correct that none were ever found? How long did that take to determine? How could it take more than a few minutes? Why were they still reviewing e-mails on Saturday November 5? Did they print them out? What exactly were they looking for? I have hundreds of thousands of e-mails on my laptop also, and I know how to find things. It’s not by printing out the e-mails and reading them. You search words. It’s not rocket science. My guess is that they knew almost immediately that they weren’t going to find the Golden Ticket. And yet they persisted. Comey makes it sound heroic, but it wasn’t. It was the opposite. They were searching and searching for something that didn’t exist, that never existed, but that they had imagined existed. There never was a Golden Ticket. This is my third blog on the Comey debacle. See my earlier entries Investigate the FBI and Letter to DOJ Inspector General Michael E. Horowitz.